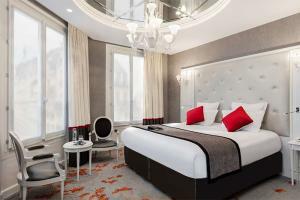 Mainson Albar Hotel Paris Opera Diamond offers a sophisticated experience in the heart of Paris. Within the stately Hausmannian building, a world of contemporary glamour awaits. The magnificent lobby and bar offer a sparkling tribute to women and diamonds, while plush accommodations will surround you in intimate baroque-themed comfort. The fitness center and concierge desk are both open round-the-clock, to accommodate your needs and schedule. Be sure to visit the charming hidden patio garden. This hotel is about a 13.5 miles from Charles de Gaulle Airport and 11.5 miles from Orly Airport. The hotel is a two-minute walk from Saint-Lazare station. Boulevard Haussman, Place de la Madeleine and the Champs-Elysees are nearby.